New York (January 30, 2014) – The inaugural production of Theatre for a New Audience (TFANA), a non-profit theatre that produces Shakespeare along side other major authors in its new home at the Polonsky Shakespeare Center in Brooklyn could hardly have been more ambitious: director Julie Taymor’s innovative staging of Shakespeare’s “A Midsummer Night’s Dream” featuring extensive video projections designed by Sven Ortel. WorldStage provided seven Christie video projectors coupled with a content handling system centered on the d3 Technologies d3 media server to meet the complex needs of Ortel and the multiple, moving projection surfaces, which help create the enchanted atmosphere critics and theatregoers are raving about. 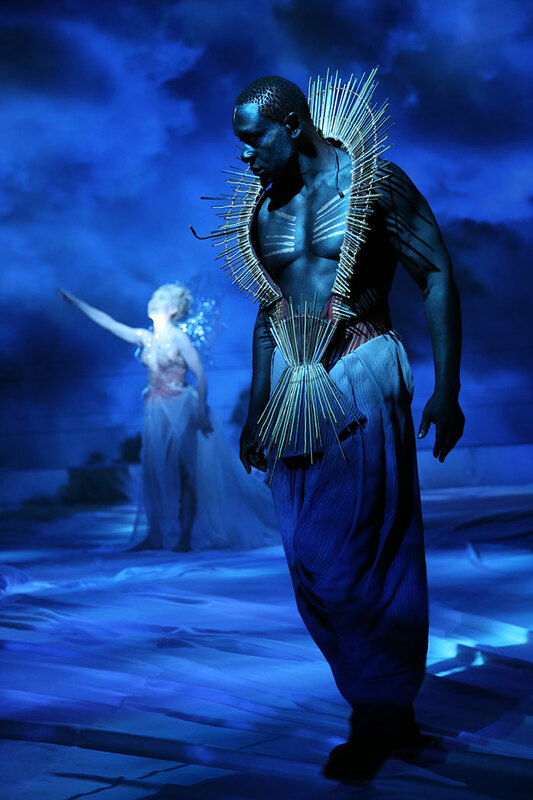 “A Midsummer Night’s Dream” opened in The Samuel H. Scripps Mainstage, a 299-seat uniquely flexible space inspired by the Cottesloe Theatre on London’s Royal National Theatre. The Scripps merges an Elizabethan courtyard theatre with a modern black box. It has seven configurations and is 35 foot high from floor to grid, nearly twice the height of a typical Off Broadway theatre. Taymor and her set designer, Es Devlin, devised a deep thrust configuration that reduced seating to 284. The deep thrust enabled the audience to get close to the stage and the performers and immerse themselves in The Bard’s magical comedy. 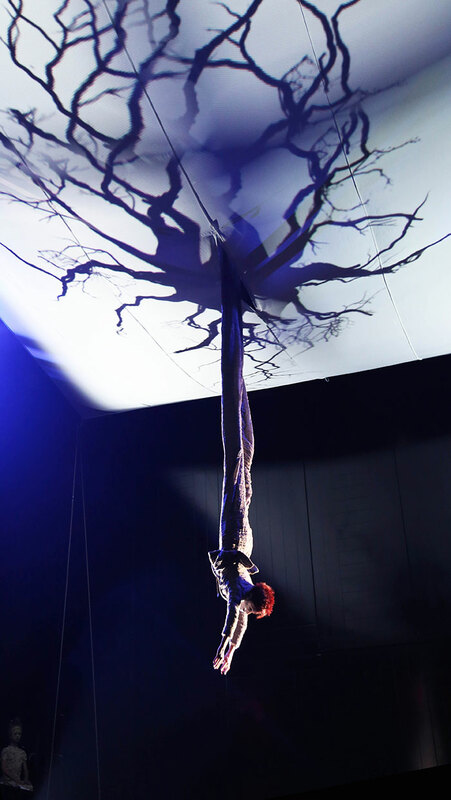 During the show, expansive moving pieces of fabric serve as multi-functional projection surfaces: They act as the sky, a wedding canopy and bower; performers on flying rigs slide down the fabric and are raised and lowered on it. Fabric sometimes becomes a ground cloth that later disappears down a trap. Fabric tumbles out of the back wall. All of it is mapped with projections to set the scene for weddings, woods and fairies galore. Sven Ortel designed projections that feature a lot of naturalistic and woodsy elements, layered clouds with evocative colors and a number of fairy elements, including slow-motion footage of moths in various sizes and intensities, which represents the fairy kingdom. Animated cut-out silhouettes also create “a bit of mystery in a scary, fairy-tale way,” he adds. Ortel selected seven Christie projectors, which are mounted in the grid, low to the floor and on the back tiers of the theatre. Two Christie Roadster S+20K projectors provide top floor projection; an M Series DS+10KM near front projection; an M Series HD-14K-M video projector far front projection; one M Series DS+10KM back projection (flown) and four more M Series units to handle canopy projection. “The projectors had to be positioned where they wouldn’t be in the way of the performers and still fulfill the function of covering certain surfaces,” notes Ortel. “Lars and his team helped me make it work – they wouldn’t go home until the job was done and that took quite some time with various iterations and changes.” Since the theatre had to act as a rehearsal venue during the day, time on site for WorldStage was limited to evenings and late nights.